Try for free our HTML5 animation tool and create beautiful and smooth animated banner ads within minutes. Start from over 1000 ready made HTML5 banner templates or create your own designs. 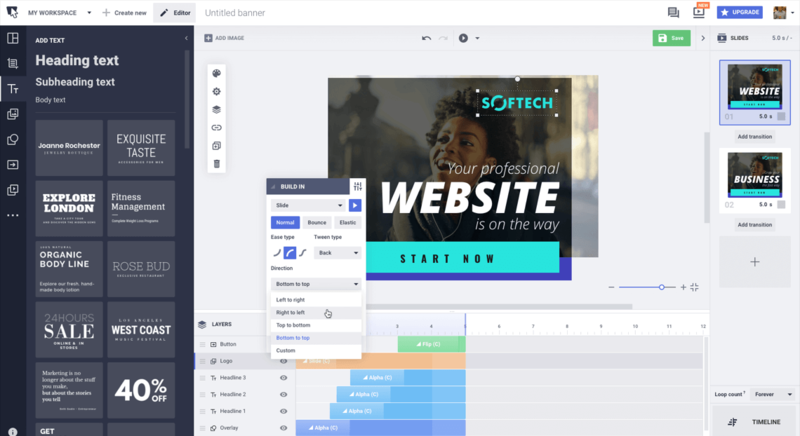 Design from scratch using our professional HTML5 editor or start from a ready-made template. We provide the tools and the inspiration so you can create faster and better. Move, fade, blur, slide, animate anything. Create intricate HTML5 animations for your banner ads using presets without any coding and technical skills. You can use your animated banners for your advertising campaigns, compatible with all major ad networks, or you can simply embed them on your own website. Animate your assets with a few clicks! Try Bannersnack and create your own website animations! Make stunning logo animations, title animations and text animations within minutes! Now you can create HTML5 content without any coding skills! 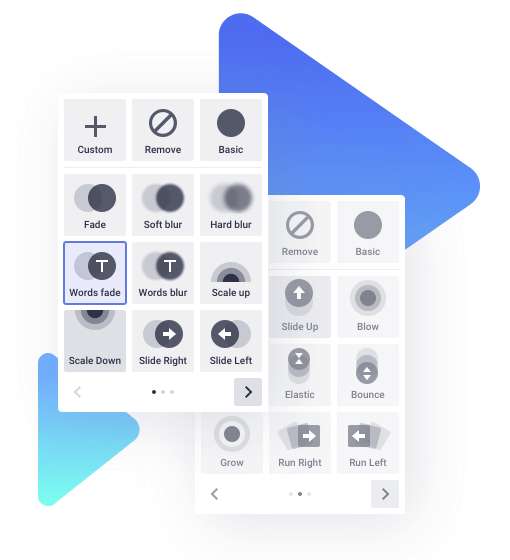 Use our intuitive, drag and drop editor. Make animated Facebook ads in minutes! Export your work as mp4 and upload it to your ads account. Find all the most popular fonts in-app, or upload your own to make creative banners with only a few clicks. Advertise your business with animations that catch all eyes and convert more. Smooth, one click HTML5 animations & transitions you can use anywhere online. You don’t have to start from scratch, you can just edit our banner templates and make them your own. Increase your banner ads click-through rate with stylish buttons. Edit them with a few clicks and place them anywhere! Animate your work without complicated tools; use our timeline animation tool. Personalise your banners, social media designs, visuals or animations with cool predefined vector cliparts. Start creating elaborate animations using HTML5 technology. 100% online no other software required. When it comes to Social Media, animated content gets noticed faster. Animate your Social Media ads to get more engagement and a better CTR. Download your animations as MP4 to make them compatible with all major Social Media networks. Download Google Ads compatible AMP/HTML animations to level-up your display ads campaigns in minutes! Use the fastest web format for better performing mobile ads. Scale your work by using our banner generator to create entire sets of HTML5 ads. Save more time and get the perfect animated ads every time!